Real coffee lovers who consider coffee drinking as a precious daily routine will probably confirm that the quality of coffee they drink isn’t everything that matters. For them, choosing the right mug can be equally important. That’s why we’ve decided to make a list of the best stainless steel coffee mugs with handle and we’re sure some of them will make your coffee drinking ritual even more enjoyable. Most of mugs are double walled vacuum insulated and it provides you hot coffee for longer time. First reason is you can microwave your stainless steel coffee mugs. Just kidding. You CAN NOT put steel mugs in a microwave. Yes, some peoples do that. They try to reheat their coffee in metal mugs in microwave andthat is not safe. But most mugs on our list of the best is double-walled vacuum insulated and that provide you hot coffee for long period. 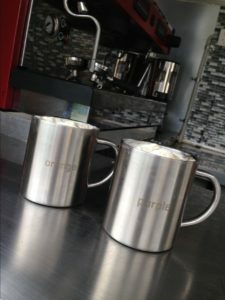 Why stainless steel why not plastic or ceramic mugs? Because SS mugs are: healthier, more beautiful, more durable than plastic or ceramic mugs. Why we choose mugs with handle? We love to our mug have handle, we do not have any other reason 🙂 Read on to find out our top picks! Sold in the sets of two, with solidly attached handle, Avito mugs are made from thick, durable stainless steel and are BPA free. Their double walls will keep your drink hot or cold and you can pour up to 14 ounces of liquid at once, which makes them ideal not only for coffee but for beer (after coffee beer is our favorite drink) and other beverages as well. The capacity of these mugs is 14 ounces. The best thing about the double wall is that if you pour a hot drink, the outer wall will remain cold and you will be able to hold whole mug (not just handle) with no problems. On the other hand, if you pour a cold drink, you won’t get the unpleasant condensation on the outer wall. Another great thing about Avito double-walled mugs is that they both have a nice, smooth appearance and are easily cleaned. 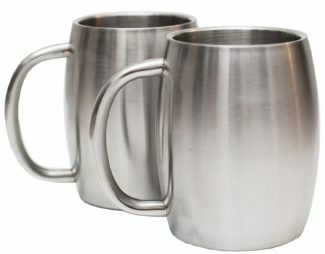 This are our favorite stainless steel coffee mugs with handle. If you do not like mugs with handles, break the handle, if you can. 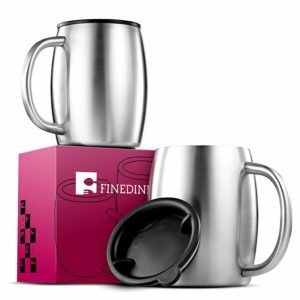 Better For Your coffee mugs made from stainless steel are also packed in pairs and their capacity is 13.5 ounces. When compared to regular ceramic mugs, these mugs will keep the temperature of your drink for a longer period and they’ll keep you from burning your hands, thanks to the double wall design. Additionally, they are both long-lasting and environmentally friendly, which means they’re built without the usage of plastic or paint. Stainless steel prevents from rusting and you can wash them in a dishwasher, while the perfectly fixed handle provides strength and superior durability. In the case your wife hits you with this mug in your head, Better For Your mugs won’t break and even if they get dented, it’s pretty likely it won’t influence their usability. 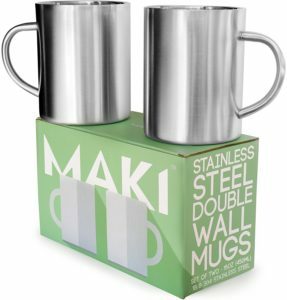 Stainless steel mugs produced by the Chinese manufacturer Maki are perfect both for coffee and tea and cold drinks. They also come in pairs and are built of the double wall, with the maximum capacity of 15 ounces. Premium 18/8 stainless steel building both the inner and the outer wall keeps the taste and the temperature of your drink the same, while the size of mugs makes them the perfect choice for different types of drinks and locations – you can use them in your home but also take them outside, for camping or picnic. Some people say that is cool mug but not keep coffee hot long enough like thumbler. OMG this is not tumbler this is mug. If you want you can check Best stainless steel travel coffee mugs some of them can keep your coffee hot whole day. If you want a quality stainless steel coffee mug FineDine maybe have great solution for you. 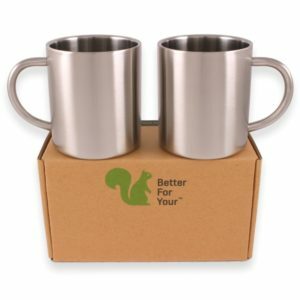 Set of two double walled insulated coffee mugs that will keep your coffee warm for a long time. Another great thing (if you’re clumsy like me and often spill coffee) is spill resistant lid. This mugs are 100% BPA free and leak resistant. At least an hour and a half your coffee will be hot and you will be able to enjoy it completely. This is possible due to the double wall insulated and lid. If you not use lid your coffee will become colder faster. Mugs are lightweight but sturdy. The insulation is great and handle is very comfortable. 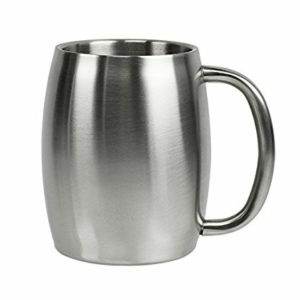 When you compare these stainless steel coffee mugs with most others big advantage is the very affordable price for this mug. They are even cheaper than some coffee mugs without a lid. Definitely this FineDine insulated stainless steel coffee mugs have a great recommendation from whole Coffee Supremacy team. This set of mugs is another great product coming from Better for Your factory. Offering you a set of two mugs, this set is literally perfect for couples, especially in the refill time. What makes it so unique is the „color“ of the mug. Well, actually, there’s no color. There’s a word etched in the outer wall of the mug telling you what’s the color of your mug. So, in this collection, you can find different sets of colored mugs, such as black and white, purple and orange, blue and pink, red and green, rose and teal, and yellow and brown. This feature probably makes these mugs the best coffee mugs for gift packs. Beside this funny feature, these mugs are a good choice because they have the double wall made of stainless steel that keeps the temperature of your drink longer than a standard ceramic mug. They are long lasting and easily washed since they are dishwasher safe. Additionally, no paint, ink, or chemicals are used in their production. This mugs are double-walled but they are not vacuum insulated. In the set produced by Peak Eclipse, you will get two double-walled coffee mugs with handles that are lighter and bigger than most mugs in the market, with the maximum capacity of 15 ounces. With a brushed finish on the outer wall and electro polish on the inside, these mugs aren’t just a practical and handy but they also have a pretty elegant appearance. They preserve your drink’s temperature for a longer period than the ceramic mugs and they are also suitable for cold drinks. 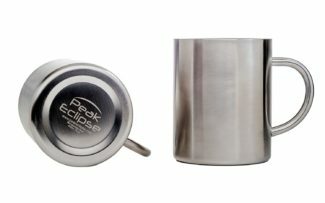 No matter whether you choose to use Peak Eclipse mugs in your home or outside, they’ll perfectly suit your needs. Since no plastic, chemicals or paint are used in their production, these mugs are perfectly safe, long-lasting and are considered top quality products at Peak Eclipse. This Double-Wall Vacuum Insulated Coffee Cup is our second choice for the best mug on our list because mug look so cool, retro and beautiful and I know for sure that this mug live longer than me. I am strong but I am not of steel. 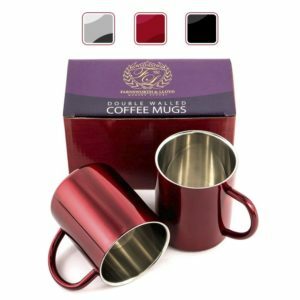 These exquisitely elegant stainless steel coffee mugs can hold up to 12 ounces of liquid and they come in pairs, in a sophisticated gift box. They are also manufactured using the double wall construction completely made from stainless steel. So, these mugs will provide you not only with charming appearance but also with the preserved coffee temperature for a longer period. You can have them in three classy colors – black, red and silver. These mugs are a convenient option both for the usage at the office and at home, but outdoors, as well. Their stainless steel construction prevents these coffee mugs from breaking in case of being dropped, while the condensation free design keeps the surfaces protected. Farnsworth & Lloyd are won in our contest for the Most Photogenic Cups Award. 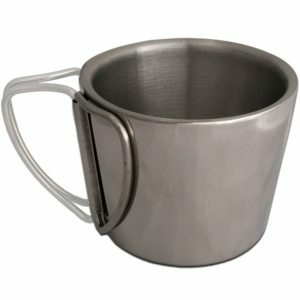 This is the coolest double wall stainless steel coffee cups with handle in 2017. Great gift to coffee snobs, coffee geeks or coffee lovers. Coming from Calans, a Chinese manufacturer, Titan Gear coffee mug with handle is made from stainless steel and has a double-wall construction that prevents your drink from losing its original temperature for a longer period when compared to a regular mug. In this mug, you can sip up to 11 ounces of coffee, tea, beer, or any other liquid. While its tough design prevents it from breaking, pure stainless steel makes it suitable for washing in a dishwasher and keeps the authentic taste of your favorite beverage. 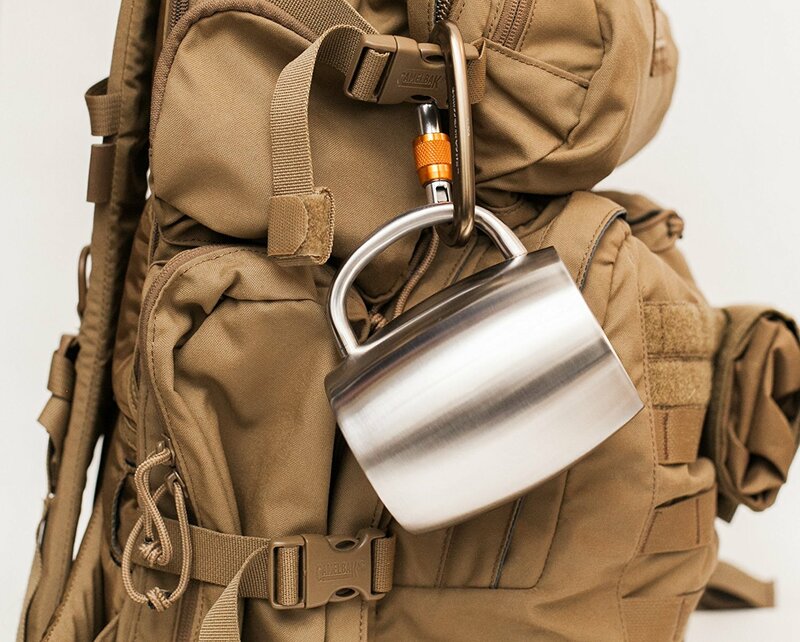 What’s probably the most awesome feature of Titan Gear coffee mug is that it has the collapsible handle which makes it really handy and practical. This means that every time you need more room in your cupboard, you can simply wrap the handles around the sides and get some space. Id you more like glass coffee cups check 10 Best Double Walled Glass Coffee Mugs I do not know for you but I am more for steel then glass because cups can last for decades. Now that you’ve seen our top stainless steel cups with handles picks, tell us – which one of them would you like to have in your collection of coffee mugs? If you’re already using any of these, we encourage you to share your experience with us! The double wall is great for keeping it hot for longer. I also like that the Titan Gear mug breaks down. It would be practical for traveling. Also check Alibaba; you can buy direct from PRC manufacturers for a fraction of what the importers charge.